The word fate is defined as a series of events that’s beyond a person control, often said to be determined by the higher power. 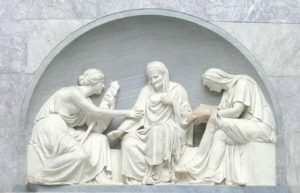 In Greek mythology, there are three goddesses sisters who determine humanities destinies from birth. There is very little that can be done to alter one’s fate once a higher power has deemed it to be. In the novella, Lizzie claims fate to be “too cruel” as her husband’s health diminished before her(256). Charles illness and death cause Lizzie great pain. She felt compelled to cheat on a dying man in order to maintain a lifestyle he made possible for her. This act can not only be viewed as shellfish and heartless but can be seen as a gold-digging act to those unaware of her hidden intentions. Stepping out of a marriage is an act deep enough to welcome bad karma but when the person loves you unconditionally and is in poor health, you are welcoming something much stronger and crueler. All Lizzie wanted was to live a wealthy glamours life with her rich husband. This was a wish spurned from her environment and time period, but like the saying goes “be careful what you wish for”. She was unable to hold on to both wishes without letting one get heavily prioritized. Her love for Charles ran deep, deep enough to where she checks on his breathing while he sleeps to make sure he is well. Likewise, her love for money ran just as deep if not deeper. She breaks her wedding vows, breaks her loyalty to him and gets labeled the community scarlet, all in the name of a wealthy bank account. Greed and envy is a deadly sin and unfortunately for Charles, he had to suffer the effects of his wife’s sin. Charles death was one example of a cruel fate. The higher power refused to let Lizzie go unpunished for her lack of regards for moral structures. What better way to punish a gold digger then by cutting her off at the source of income, her husband. Cruel fate is always accompanied by a crueler irony; Lizzie gets one wish destroyed which results in her second wish of wealth to be fulfilled. She acquired all the wealth that came with her dead husband’s estate. if she has a conscious she will feel the guilt of committing adultery with every dollar she spends, every event she hosts and every night she falls asleep in her own home. Fate can be amazing to those who deserves its mercy, but to individuals such as Lizzie, fate is cruel. It answers your prayers and wishes by destroying something you hold close. Lizzie’s story is not one to go unacknowledged, her glory to riches teaches the readers to be aware and grateful for what you have and to be mindful of what you want. Your wants and desires can be so powerful that it consumes what you already have.